Bill was born and raised in Phoenix. He completed his undergraduate studies at Arizona State University where he earned two bachelor degrees and graduated with honors. After college he moved to the Washington D.C. area where he earned his Juris Doctor degree from the University of Maryland. After accepting a position with a Gilbert law firm, he returned to Arizona to be closer to his family. 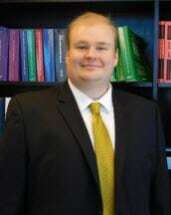 He is licensed to practice law in both Maryland and Arizona. Bill's practice focuses primarily in the areas of estate planning and probate, bankruptcy, bankruptcy litigation, small business insolvency, and civil litigation. As an attorney he has represented national financial institutions in complex litigation and has an insider familiarity with how banks approach complicated insolvency situations. Bill spends his time away from the office with his family and friends. While living in Maryland he discovered the wonderful world of sailing - joining the Annapolis Sailing Club and sailing to various destinations around the Chesapeake Bay. Since returning to Arizona, he has satisfied his love of the outdoors by hiking and playing a weekly golf game with friends. Bill has volunteered with Hospice of the Valley and has advocated for an expansion of hospice services to rural patients.